CELEBRATING ALL FORMS OF BROKENBEAT! PERFORMANCES BY MS.EASY FEATURING TEAM EZ! MASTER OF CEREMONIES - SIR HEADIUS! SURPRISE GUEST HEADLINER PERFORMANCE BY ?! HOSTED BY ILLEVEN ELEVEN REC. Last edited by Expansion Agency on Mar 1 2010 12:30 am, edited 5 times in total. Last edited by Expansion Agency on Feb 19 2010 01:59 pm, edited 1 time in total. 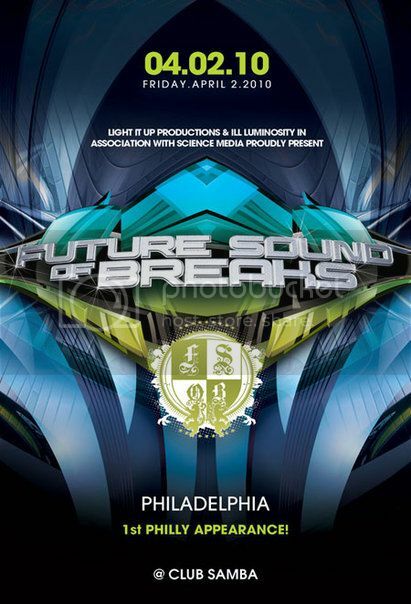 FUTURE SOUND OF BREAKS Special Announcement! GA + VIP Tickets both available this year! VIP Package avail on Wantickets! BAHAMUT exclusive new live performance added to the FSOB bill! FSOB WMC Official After-Party in Philadelphia! AK1200 featuring MC Questionmark @ FSOB!